100% sanded polyurethane shell, 100% polyester backing and lining with gingham-check pattern, Button-off hood, Box-quilt collar and turned up cuffs, Inside upper welt pocket, Invisible zipper for easy embroidery. 100% water-repellent polyurethane shell, 100% polyester dyed-to-match lining, Inside left welt Zippered pockets. 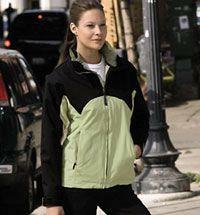 Wind and rain-resistant microfiber shell and mesh/satin lining for breathablility and comfort. Adjustable cordlocks inside pockets and at hem. Two way zipper, elastic cuffs, dyed to match buttons. Longer drop tail for added coverage. 100% polyester shell, 100% polyester mesh upper back lining, 100% nylon lining on lower back/front/sleeves; contrasting neck trim. Features lower slash zip pockets. Port Pocket(tm) access for easy embroidery. Princess cut provides a feminine fit. Adjustable buckles at sides allow for a tailored look and provide added design detail. 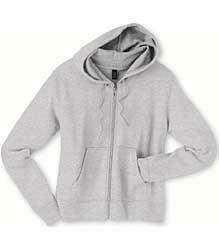 Features button-off hood and roll-up cuffs. InconspicuZip for easy embroidery access; 100% Taslon nylon shell; polyfill unsulation; contrast platinum lining; hidden front panel zip pockets; zippered pocket on outside left sleeve; teardrop zipper pulls. Matches with Men's style #D730. 100% polyurethane twill shell, 100% polyester double-knit backing, Top half lined with soft faux fur, A-line cut, Decorative horseshoe-shaped stitching, 2 outside zippered pocket. 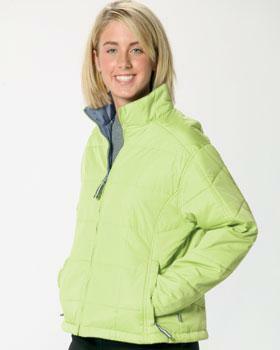 100% polyester 11.0 ounce jacket. 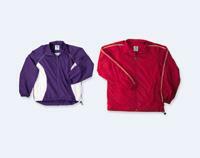 Drytech(tm) Dura performance fabric features wicking capabilities, durability and warmth. 100% polyester 7.1 ounce Drytech(tm) contrast color accent panels feature moisture wicking and breathability, with an anti-microbial treatment. 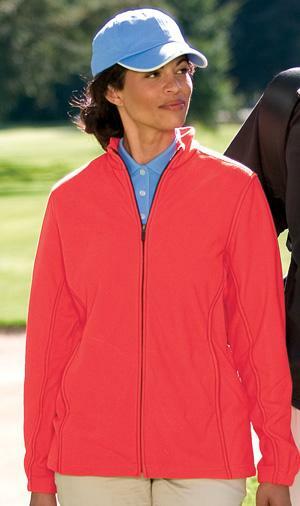 Full front zip with windblock zipper and free standing collar. Enclosed side pockets. Raglan sleeves. Ladies' style is cut for her. 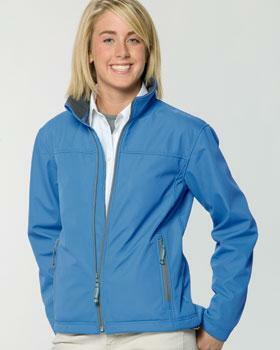 100% cotton chambray lining 9.5 ounce ladies' lightweight canvas jacket. 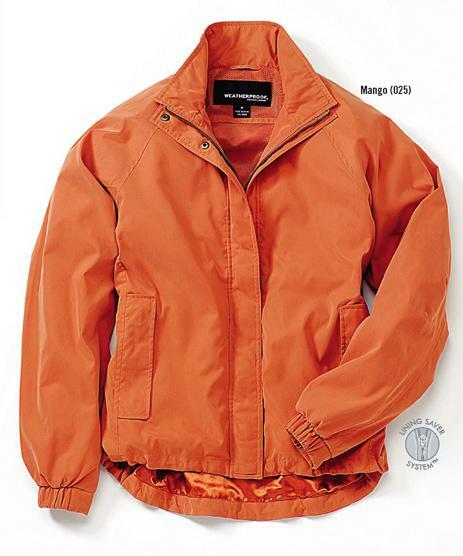 Garment washed with a special DRI DUCK enzyme to produce a peach-wash finish. Jean jacket styling with front princess seams. Binding along center front and waistband. Metal shank buttons. Inside cell phone pocket with Velcro � closure. 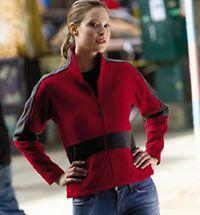 100% polyester bonded anti-pill microfleece jacket. Adjustable drawcord hem. Contrast color panels and piping along shoulders and arms. Front on-seam pockets. Matches with Men's style BMF-1. 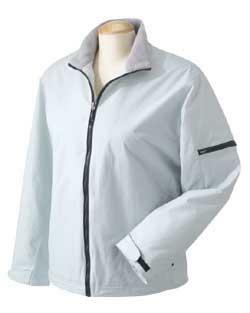 Polyester mesh lining with piping on inside seams; zipper windguard; hidden front zip pockets; adjustable cuffs; drawcord hem; weather-stopping shell. 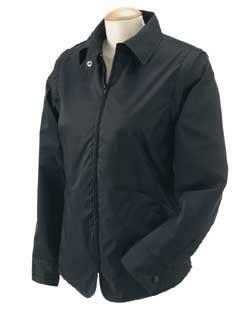 100% performance nylon ladies' jacket with mesh and taffeta lining. Wind and waterproof. Fully taped seams. YKK zipper with snap closure. Hidden inside zipper. Front and chest pockets. Inside cell phone pocket. Back vent for embroidery access. Adjustable waist drawcord with cord locks. Roll-up hood packs into collar for storage. Elastic cuffs. Locker loop. Coordinates with Men's style 3118. 100% polyester, wind and water resistant, Lining: 100% Thinsulate(tm) Insulation, lower pockets on both sides, Lycra binding at cuffs, zipper opening for embroidery, reverse side is fully finished with piping on sleeves. 100% nylon ladies' taslon jacket. 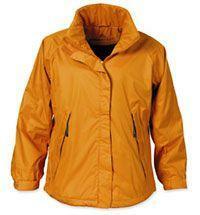 Durable STORMTECH DWR wind and water-resistant outershell. 100% anti-pill polyester polar fleece lining. Fully insulated body, sleeves and collar. Relaxed fit elasticized waistband. Stand-up rib lined collar. Adjustable elastic cuffs with tabs. Front zippered pockets. Inside welt chest pocket. Matches Men's style XLF-3. 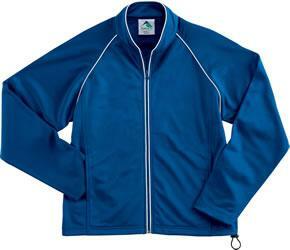 100% Polyester stretch woven shell fabric bonded to 100% Polyester Microfleece with a laminated film insert. Wind and water resistant. Features front zippered pockets and chest zippered pockets with zipper garage. Open bottom hem and Lycra-trimmed cuffs. Princess cut creates feminine, tailored look. 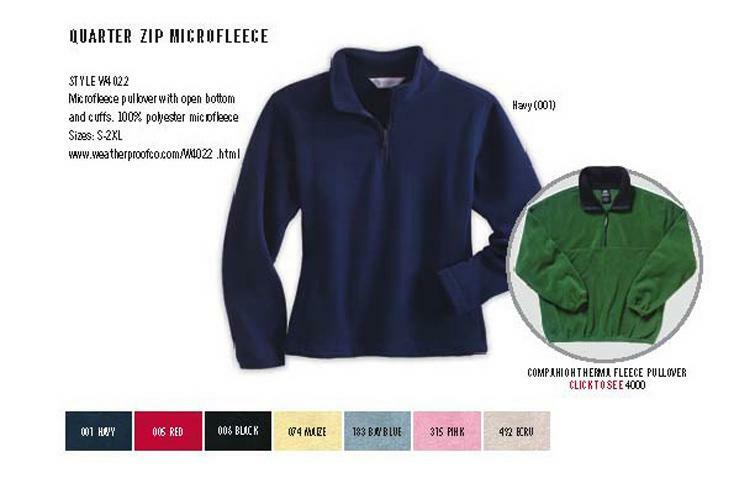 100% Polyester Soft Shell with an additional windproof, water-resistant and breathable exterior layer, bonded to soft polyester fleece lining, micro fleece lining in collar, full wind-guard under front zipper, draw-cord hem, zipper opening for embroidery. Quarry wash 12 oz. 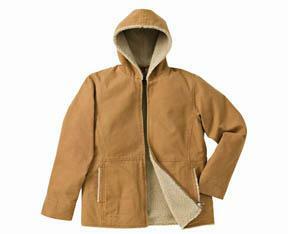 canvas with exclusive extra heavyweight sherpa body and hood lining. Tailored fit especially for her. 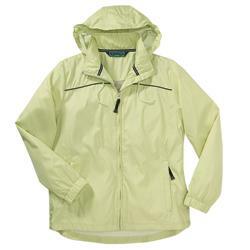 100% polyester ladies' rainshell jacket. 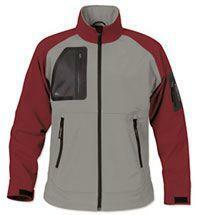 Breathable waterproof ripstop outershell with H2X � technology. Adjustable drawcord hem. Fully seam-sealed. Concealed roll-away visor hood with elastic drawcord. Hidden embroidery access panel. Matches with Men's style SPX-1. 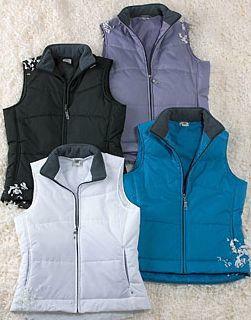 Four-way polyester ladies' stretch soft shell jacket with three-layer construction. 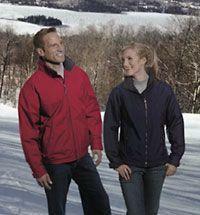 Breathable Teflon � waterproof finish. Ladies' fit tapered through sides. Elbow darts and on-seam hidden sleeve pocket. Two front zipper pockets. Inside storm flap. Inside pockets for cell phone and MP3 player. Dropped back hem. 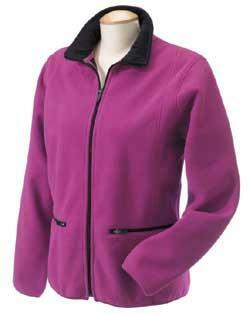 100% polyester ladies' fleece jacket. Breathable waterproof membrane with H2X � technology. 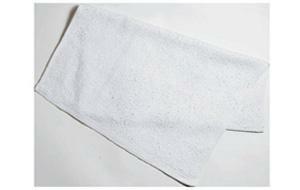 Laminated 100% polyester mesh lining. Adjustable drawcord hem. Contrast sleeve and side panels. Zippered hand warmer pockets. Matches with Men's style BWJ-2. 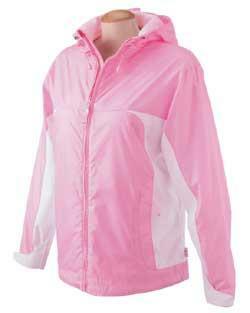 100% polyester ladies' rainshell jacket. Waterproof and breathable outershell with H2X � performance capabilities. 100% polyester mesh on top half of jacket lining. 100% tricot on lower half of jacket lining. Waterproof and breathable Microflex(tm) 2-way stretch panel inserts along sides. Fully seam-sealed. Concealed roll-away visor hood with elastic drawcord. Full front zipper under stormflap. Front zippered pockets. Matches Men's style MLX-2. 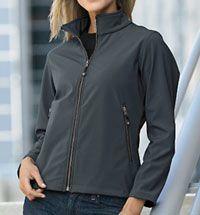 50% polyester/45% nylon/5% elastane ladies' jacket. Breathable waterproof outershell with H2XTREME(tm) performance capabilities. Laminated with matrix brushed tricot. Adjustable single-hand drawcords at waist. Front waterproof zippers with full-length inner storm flap. Outer bonded laser cut right chest pocket and left arm pocket with waterproof zippers. Hidden embroidery access panel. Outer right chest MP3 player pocket. Embossed logo on right sleeve. Matches with Men's style S-1M. 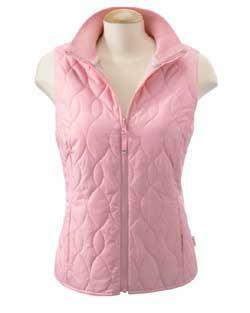 100% nylon ladies' jacket. Breathable waterproof outershell with H2XTREME(tm) performance capabilities. Fully lined with nylon and brushed tricot. Removable hood. Adjustable single-hand drawcords. Laminated front placket, cuffs and hood brim. Bonded laser cut right chest pocket and left arm pocket with waterproof zippers. Transparent ID Pass pocket on left sleeve. Inside MP3 player pocket. Matches with Men's style T-1M.